The choice of the correct sisal disc, with the correct combination of sisal fabric and possibly cotton fabric, the correct number of quilting circles and the correct dimensions, must be determined customer-specifically for the respective application. Our employees with their many years of experience will be pleased to advise you by telephone or at your site regarding a high-quality and cost-effective design of sisal discs for your process. 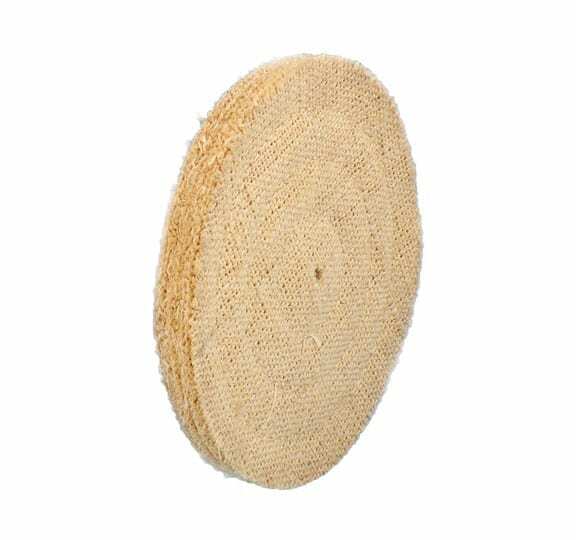 The sisal disc is made of a combination of dense, full round sisal and cotton fabric. As standard, one layer of sisal fabric is followed by two layers of cotton fabric. This structure significantly increases the strength of the sisal disc. Of course, other ratios between sisal fabric and cotton fabric can also be selected. The standard quilting or seam distance for the sisal slice is 10 mm. Other stitchings can be produced on request at any time. In order to obtain optimum working results, it is recommended to use impregnations for the sisal disc. Impregnations greatly improve the service life of the sisal discs, the adhesion of the polishing paste and the quality of the work result. In principle, it can be said that very hard impregnations are also used when machining workpieces made of very hard materials. For workpieces made of very soft materials, however, very soft impregnations are also used. Sisal discs are used for pre-polishing, fine grinding, brushing and matting of flat and slightly deformed workpieces. The very hard “pre-polishing wheels” are ideally suited for processing rough surfaces and scratched workpieces.